The USDA lowered wheat demand estimate in its monthly World Agricultural Supply and Demand Estimate released on April 9. At the same time it increased old crop wheat carryout by 32 million bushels to 1.087 billion. A day before the WASDE report USDA indicated wheat export inspections amounted to 9.8 million bushels, far short of the rate needed to meet USDA forecast with less than two months to go in the 2018 marketing year. A week before that US wheat yield estimate was raised in all but three states based on crop rating reports. Wheat supply estimates were improved also for Australia with rain forecast this week. Weak demand and higher supply estimates are bearish for wheat. On the daily timeframe the WEHAT: D1 is below the 50-day moving average MA(50) which is falling, this is bearish. The MACD indicator gives a bearish signal: it is below the signal line and the gap is widening. The RSI oscillator has levelled off and is not in oversold zone yet. 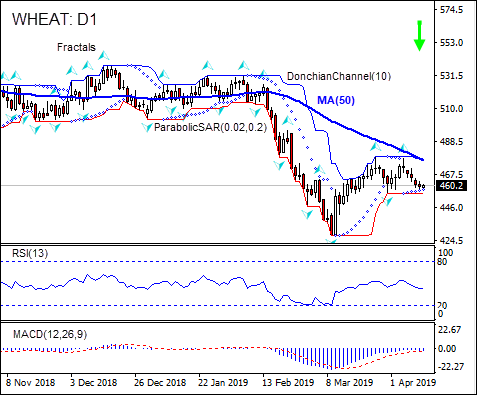 We believe the bearish momentum will continue after the price breaches below the lower boundary of Donchian channel at 455.2. This level can be used as an entry point for placing a pending order to sell. The stop loss can be placed above the last fractal high at 478.0. After placing the order, the stop loss is to be moved every day to the next fractal high, following Parabolic signals. Thus, we are changing the expected profit/loss ratio to the breakeven point. If the price meets the stop loss level (478) without reaching the order (455.2), we recommend cancelling the order: the market has undergone internal changes which were not taken into account.